Brave Coffee and Tea Co. The Waterbury Holiday Stroll Takes Place This Saturday! Experience the holidays in true Vermont fashion at the Very Merry Waterbury Holiday Stroll. Local stores, restaurants and breweries invite visitors to shop their vast array of products, provisions and services. Pick up a Wrap It Up & Win card and enter to win prizes! Small Business Saturday & Waterbury Artisans' Boutique! If you spend $100 at a local business, about $68 stays in your local economy. If you spend the same at a large business, only $43 stays in the local economy. Please join us at Stowe Street Cafe on Friday, November 3rd from 6-8pm to celebrate the completion of our most recent project - an art installation on the cafe deck by Waterbury artist, Torrey Smith! Time to Start Holiday Party Planning! Have you started planning for upcoming holiday gatherings? Need a cozy and inviting space to host your holiday party? 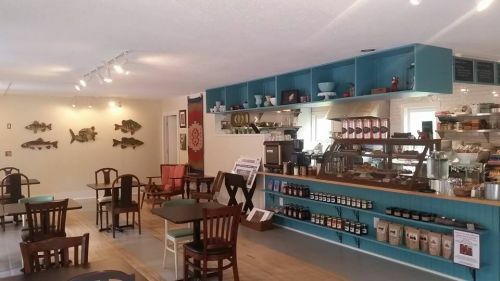 Bridgeside Books and Stowe Street Cafe can provide for all of your party needs including office parties, book groups, or a gathering of friends! Fall is in the air, so throw on your favorite flannel, fleece or sweater and come get cozy with our Fresh Baked Doughnuts, House Made Chai, and Made-from-Scratch Soups & Stews inspired by the season! The cafe will offer an extensive selection of specialty teas brewed to order and custom-roasted coffee from nearby Brave Coffee & Tea. 170765 times over the past 30 days.